As a business in Tualatin for over 27 years and residents of Tualatin, here at Lakeside Family Dentistry, we feel it is important to be active and support our Tualatin and Tigard communities. Each year during National Children's Dental Heath Month Dr. Travis visits local elementary schools to educate kids on proper oral health habits. Approximately 600 kindergarteners, 1st, and 2nd graders are taught proper brushing and flossing techniques, given a dental activity book, and a brand new toothbrush. Visiting schools and educating children is a tradition that Dr. Rick started over 20 years ago. Here Dr. Travis is teaching the proper brushing technique with the help of a volunteer and puppet, Leo. Dr. Travis teaching and entertaining a class of elementary school children. 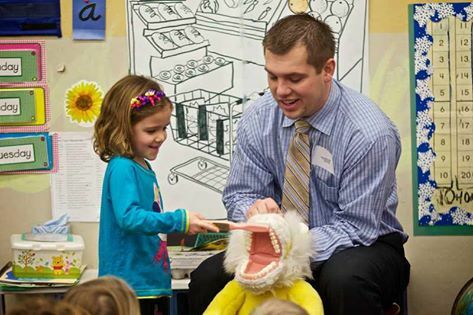 You can read a Tualatin Times article about Dr. Travis' school visits here. For several years Dr. Rick has provided free dental care through Oregon's Donated Dental Services program. Byrom Elementary, Tualatin Elementary, Tualatin High School Football Team, Tualatin High School Equestrian Team, Tualatin High School Soccer Team, Tualatin High School Baseball Team, Tualatin High School Cheer team, City of Tualatin Boys Little League Baseball, Oregon Donated Dental Services, Tualatin Historical Society, Boy Scouts of America, Girl Scouts of America, Tualatin Chamber of Commerce, Tualatin High School Timberwolf Support Organization, Tualatin High School Theater, Tualatin School House Food Pantry, Tualatin High School Volleyball, Medical Team International, as well as providing a free mouthguard clinic to all Tualatin Youth football players. We enjoy participating and promoting oral health each year in the Tualatin Crawfish Festival. We appreciate our patients! We understand that it is our patients and our community that make our practice successful.